Paul Merton is without doubt, the funniest man on radio and television at the moment. Also the wittiest – and has been so for a number of years. The rate at which something inventive and hilarious will suddenly leap forth into his most colourful, idiosyncratic imagination, is astonishing, inspiring and more often than not, absolutely nothing short of simply brilliant. In other words, Merton is a modern day Groucho Marx – a comparison I’m sure the south-London comic will embrace with all the acute, gazelle like speed of cathartic wonderment – which says a lot considering generational difference and the fact that the former was born on the Upper East Side of Manhattan the latter in Parson’s Green. But that’s comedy for you, a place where there are no rules and there are no parameters. 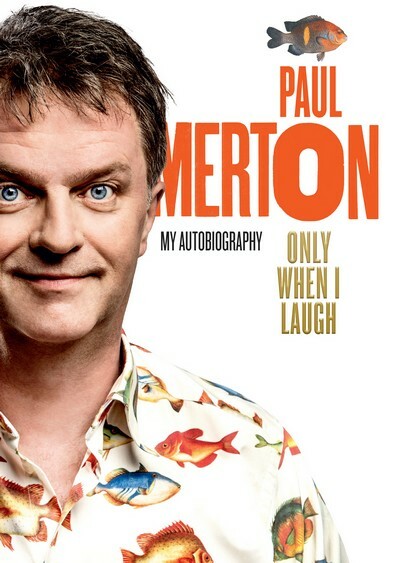 This is why I wanted to read Paul Merton: My Autobiography – Only When I Laugh; as I’ve always been compelled to find out more about what essentially makes comedians tick. And I don’t mean the vast array of five-minute wonders; the totally unfunny toss-pots, that have always (and continue to) litter the comedic terrain with all the smug and pointless gallantry that’s comparable to cement. I mean the true geniuses like the aforementioned Marx, Charlie Chaplin, Tony Hancock, Peter Sellers and Peter Cook – of which Merton is clearly one. As for this book, well its 334 pages are written in chronological order and they touch on varying facets of Merton’s life. From his early years in Fulham to what sounds like a resoundingly strong work ethic; from both romantic and professional relationships to his all round approach to comedy writing. It’s twenty-three chapters bequeath a flavour of what it’s like to be Mr. Merton. ”I had full houses every night and always strove to be at my best for the people who had paid to see me. And yet. I didn’t enjoy any of it. Listening to myself onstage talking for an hour was boring to me. I used to pray for somebody else to walk on. A comedy butler played by a Comedy Store Player. A bit of human interaction. I loved the impro shows with The Comedy Store Players. In comparison, stand-up felt like I was drawing in pencil compared to the lush Technicolor pastures of group work. After all my effort, all the dreams I’d had, the awful truth started to dawn on me – I didn’t want to be a stand-up comic anymore. In itself, this is somewhat revelatory. Although given Merton’s particular brand of comedy, utterly understandable – as are many other segments of Only When I Laugh. An altogether terrific book, which I have to say is (on occasion) candid, poignant, and rather lovely.